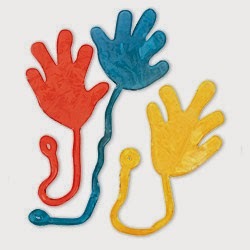 If you begged your parents for a quarter every time you saw a vending machine, surely you remember those awesome hand-shaped sticky, jelly toys that were so much fun to slap against the wall.... until they lost their sticky after half a dozen splats! These things were a staple in my toy box growing up! Even after the string came off and they were covered in dirt, hair, and who knows what else! To paint my sticky hands, I watered down a few polishes with acetone in hopes of making them look a little more transparent and squishy. I used Dermelect Power Trip, Pixel Turquoise the Noise, Color Club Disco Dress, Nails Inc. Queen Victoria Street, and Sinful Colors Clementine. Don't forget to check out everyone else's childhood manis today!